I lost it a bit yesterday. I’ve got a soda problem. I just love it. And I know it’s terrible. It’s chemicals in a can. It’s got caffeine, and I’m ridiculously sensitive to caffeine–if I have two Coke Zeros, then I’m screwed, sleep-wise. So I’m intermittently abstaining from soda, trying to quit, or off the wagon completely in what appears to be an endless cycle. If I could keep it to one or two cans a week, that would be acceptable, but it’s tough. Right now I’m once again in cold-turkey mode. This time, I’m augmenting my #1 favorite beverage–tap water–with the occasional chai iced tea and club soda. Drinking club soda at my sister’s reminded me that I like club soda much more than seltzer. Which is a shame, because it seems very similar except that it’s got some added sodium and it tends to be less conveniently available. Also, the bottles, while cute, seem shockingly wasteful to me, yet I can’t commit to the big plastic bottles because I wouldn’t drink enough before they go flat. You know that I’m cheap. So I went out and bought myself some cute little bottles of club soda, but I perversely feel like they are a special treat. Meanwhile, my kids aren’t allowed to drink soda. Or, at least, not under everyday conditions. Usually, we try to just act neutral and model good behavior when it comes to dietary choices, like my mentor Ellyn Satter says. But this doesn’t work, because Cute W and I love soda, and we hate how much we love soda. The girls can have a soda at parties, they’re usually allowed up to one soda per day on vacations, and sometimes at the movies or a restaurant. They rarely finish the sodas, like that time we bought them on our “live”-blogging car trip. Really, they just like the idea of soda. Because it is forbidden at their house, it is pure animal instinct that they must ask for it repeatedly and accept it whenever it’s offered. Dogs have to pee everywhere. Seagulls must pester you if you try to picnic on the beach. And my children must beg for soda. We know (and if we didn’t, Ellyn Satter would tell us) we’ve created this monster. Still, it’s monstrous. So, yesterday, M asked to try a club soda. She doesn’t like club soda. Both girls have tried club soda and seltzer, and they don’t like either one of them. Still, its soda-like effervescence called to her, and it seemed better to let her try so that she’d just remember that she didn’t like it. So I repressed a sigh and consented. In opening the bottle, M sprayed club soda all over the floor. Okay. A rookie mistake. Then, as she started to lift the bottle to her lips, I suggested, “You know, it would be better with some ice. Room temperature probably won’t taste too good.” M ignored me and took a sip. And then, with great drama, she ran past the sink and to the nearest door, where she spat out her small taste of club soda. But she was determined, and J was now intrigued and asking for a taste. I pulled out the ice cube tray and two glasses. M ignored me and the glass, instead pressing an ice cube at the top of the bottle, because the bottle is cute. This drove me slightly crazy, because the ice cube was clearly too large for the mouth of the bottle. But I restrained myself admirably. Finally, M gave up and poured some club soda over the glass with ice, setting down the half-full bottle as the (small) glass fizzed to the rim. I picked up the bottle in order to pour the other half into an ice-filled glass for J. As I lifted the bottle from the table, M grabbed it by the bottom. Because she did not want to share. She did not want to share the bottle of the stuff that she had, moments ago, run moaning to the door to spit out. I was forced to use italics so that we’re clear on how freaking ridiculous she was being. Alas. I chose to descend to her level. This is when I said, “Let go.” And she ignored me. Since she was tiny, M has done this. She digs in her heels, driving me from somewhat sympathetic to mildly annoyed to extremely irritated to ballistic. She was the toddler who ran screaming from time-out until I would put her into her room and close the door and hang onto the knob from the outside for her own protection. Usually it’s over something stupid. Like half a bottle of club soda. So we played tug of war with the bottle while I said, “Let go-let go-let go!” with a steadily rising voice, much like Bill Cosby with his “Come here-come here-come here” routine (which, if you don’t know this, you simply must click over and watch a bit–funny, too, because apparently he has child/soda issues, as well). I’m not proud of this. Here’s yet another way in which I am utterly screwed as a parent. I hardly ever yell. You would think that my children would appreciate that, especially when you can hear parents say all sorts of nasty stuff in all sorts of mean voices just at the grocery store. Oh, no. Instead, I have raised children who are deeply sensitive to the slightest change in tone of my voice. So when I raise my voice into loud talking, they are appalled, wounded, aggrieved. And I feel like CrapMom. At approximately the fifth “Let go,” M wisely chose to let go, and I proceeded to pour the other half of the club soda into J’s half-filled glass. At this point, M, emotionally-wounded-by-loud-talking-Mommy, exited the house. Whether it was merely to avoid hanging around with me or, as I suspect, in order to try one more sip of the cold club soda and then feel free to pour it into the closest shrubbery while I wasn’t looking, I don’t know. What I do know is that we have a no-walking-outside-with-glass-or-ceramics policy that I had not yet reviewed for the spring season. Still, you’d think my 9-year-old would remember this. But instead of following her and insisting that she re-pour the club soda into plastic, I just thanked my lucky stars that she was out of the damn house. Then I turned to J, who was attempting to dislodge additional ice cubes from the empty ice cube tray. “Two ice cubes should be plenty to make it cold enough,” I advised. “If you want it colder, you can stir it around.” She wanted it colder, of course, because she does not like club soda. She thought that if it were colder, she might actually like it. She sat for a minute, looked at me furtively, then got up and walked over to our counter-top water tank to add some water to the club soda to make it more palatable. At which point I lost it again. “Stop right there! If you want to add water, it’s because you don’t like the club soda! Give me your club soda and I will drink it for you, because I actually like the club soda just the way it is! And I actually have to go to the store and pay money to buy the club soda. Water is free! 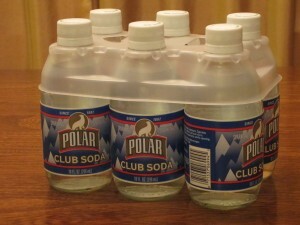 So, if you don’t like the club soda, don’t drink the club soda! Drink the delicious, readily-available, completely free water!! !” All of which I said in my very loud talking voice. “Never mind,” she sniffed. “I don’t want it anymore.” And she took her glass of club soda and fled the room. Last night I tried to write this post and it felt too unbelievably tedious to write. Because it was so unbelievably tedious to experience. But I know that some of you are entertained my most most epic parenting fails, so. . .VOILÀ. And it gets even better. The girls were awake this morning before either of us, and when he came downstairs, Cute W discovered a half-full bottle of club soda sitting on the kitchen table. He asked, and neither of the girls ‘fessed up. So, what about you guys? Do you have food or soda battles? Do you think I should never mention club soda again, forbid it and lock my club sodas in a liquor cabinet, or give up and have us all drink soda to our heart’s content? You should try the Soda Stream and make your own. After the initial investment, it’s lot cheaper and far less wasteful than buying soda. I make bubbly and add fruit juice concentrate. It’s a win win, less chemicals and sugar, and the kids love it. I try this trick of trying to let my D taste something that’s bad for her, feeling fully confident that she wouldn’t like it! But majority of times she ends up liking it So not so much anymore! I would probably stand firm about not allowing the kids to drink something they don’t like, that you paid good money for. I have to commend you on the not yelling thing. Not yelling is a huge struggle for me. I’ve been doing very well the past month, and hope to keep making progress, but it’s a challenge (I grew up in a house with lots of yelling). Oh how I empathize with this post. Everything about it. We are totally with you on the on-and-off-again bandwagon of soda cessation. J and I are also soda fiends. Worse, we prefer diet (which as well all know is absolutely laden with things that are Horribly Unnatural and Potentially Cancerous…and yet we can not seem to kick the habit). When we moved, we swore we were giving up soda for good. We would not bring the Evil Tonic into our new abode. Yeah…you know, until we REALLY wanted some. I’ve even taken to refusing to buy it when we go grocery shopping, but all that leads to is us paying more for it when J ends up picking it up at Stewarts. We don’t give it to the girls at all, though. In our house, it is treated like beer: for adults only. I’m desperately afraid that they will like it and become as helplessly addicted as J and I are. And I really, REALLY, want them to have better habits than I have. Fortunately, we have thus far been able to avoid them having it at BBQs (where usually water or juice is also available) and they never order it at restaurants. Not sure how long I can keep them sheltered from the bubbly deliciousness, but I’m damn well going to try. I gave up POP in December — but I’ve had a couple here or there (at movies or if I’m sick, real Coke tastes good). But I don’t crave it at all anymore. I also gave up coffee. $4 chai lattes from Starbucks though? Nope. Sad. Dude, sometimes you have to lose it with your kids, because they need to see you have your limits of annoyance. You’re a terrific mom. Your girls are fantastic. Give yourself a break, K! I gave up soda January first and I craved it more than any other food or sweet. My way around it is Saratoga Sparkling Water. Seriously, I have an addiction to this stuff like nothing you’ve seen. It’s better than seltzer OR club soda. And comes in a pretty glass bottle. I even display some of the bottles in my house. I add lemon and some Stevia once in a while to make my own soda. I also drink Stevia soda on occasion. It’s not great, but if you’re really having a craving it is decent and much healthier than anything else out there. The Root Beer one is OK. My kids have no problem drinking it. Good luck to you! I’ve lost a lot of weight since I gave up soda too! REST ASSURED, its OKAY to have different rules/standards for adults!!! i say “my kitchen” to my children. i call it “my bedroom”. i dont usu have forbidden foods, as a rule, i think they just beg for trouble. if i feel the item is that bad, its not in the house. i also try to role model by not consuming things that i dont want in my childrens perfect little bodies. yes, im serious! all it took was a few rounds of barfing when the kids were 2or 3 to find out they really didnt like the regular stuff anyways. but i do keep some stand by essentials on the back porch for tummy trouble and random adult mixers. a few natural ginger ales, sierra mists, vitamin waters. i kno what ur thinking, lol those Stafford’s are off the hook! these never hurt anyone, but they are NOT allowed to just help themselves. they kno they are reserved for special occasions and i really try hard to say “yes” when they ask, because they have come to ask so rarely that i almost feel guilty abt it. can u believe i actually had soda GO BAD? my kids have perfect teeth with no cavities! if thats all i can say that i did for them , then my work here is done! p.s. you are a saint! Record number of comments here. I am with HollowSquirrel on this one. Dude. Thanks, everyone, for your kind and supportive comments! I think I’m on about day 5 of no soda. The soda stream might be a worthy idea–thinking about that one. And I wouldn’t ever cave on it completely. The club soda’s off limits now. The problem is, I argue that they should try foods again sometimes in case their tastes change, so I have to let them taste once in a while. . . . but come to think of it, they haven’t mentioned it again. So maybe we’re good for now. And I know, generally, speaking, that I’m a good mama–truly I do. If I were falling down a complete shame spiral, I probably wouldn’t admit any of this! But whenever I see blogs where the bloggers talk about how wonderful they, their children, and their homes are, it just irritates me. So I’m here to provide balance! Did you read my review of the soda stream?